Does walkability equate with bikeability? Through a comprehensive review of studies of the built environment and bicycling, including mode choice, route choice, safety, and urban design literature, this paper addresses this question. Previous work has raised the issue that the two modes are functionally different, despite them often being combined into a nonmotorized category, and has highlighted research challenges. Existing studies of bikeability have largely focused on infrastructure. 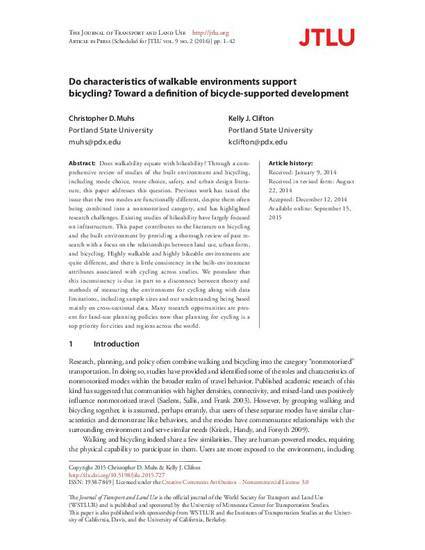 This paper contributes to the literature on bicycling and the built environment by providing a thorough review of past research with a focus on the relationships between land use, urban form, and bicycling. Highly walkable and highly bikeable environments are quite different, and there is little consistency in the built-environment attributes associated with cycling across studies. We postulate that this inconsistency is due in part to a disconnect between theory and methods of measuring the environment for cycling along with data limitations, including sample sizes and our understanding being based mainly on cross-sectional data. Many research opportunities are present for land-use planning policies now that planning for cycling is a top priority for cities and regions across the world. Muhs, C. D., & Clifton, K. J. (2016). Do characteristics of walkable environments support bicycling? Toward a definition of bicycle-supported development. Journal of Transport and Land Use. Volume 9, No. 2.